I’ve said on here before how much I love asparagus and I’m very certain I will be saying it again before the season is over. Earlier in the week I went really simple with steamed asparagus and slithers of Ticklemore cheese popped under the grill until the cheese was just melting. The salty goats cheese was great with the asparagus. I didn’t take pictures though because I was so busy eating it. 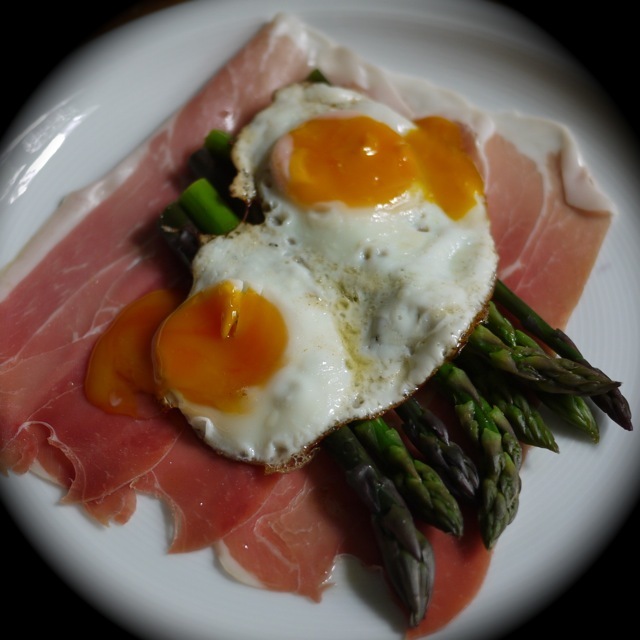 Today I went for Parma ham, steamed asparagus and fried guinea fowl eggs. I don’t think you need instructions to be able to copy this, of course feel free to substitute the egg of your choice. This week I am mostly eating asparagus from Norfolk.